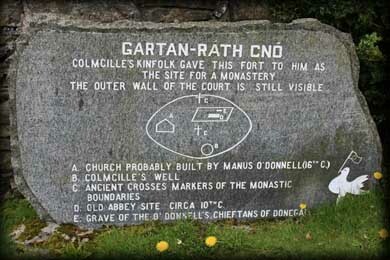 The monastic site at Gartan may seem quite small, but this beautifully situated site is huge when it comes to history. Famous for being the birthplace of St Colmcille who was born here on the 7th December 521 AD. There is another site close by at Lacknacoo that lays claim to being his birthplace, but many believe that Colmcille was born here at Gartan and slept on the flagstone of loneliness at Lacknacoo before he left for Iona. Other sites believed to be founded by St Colmcille include Derry, Drumcliffe, Durrow, and Iona in Scotland. 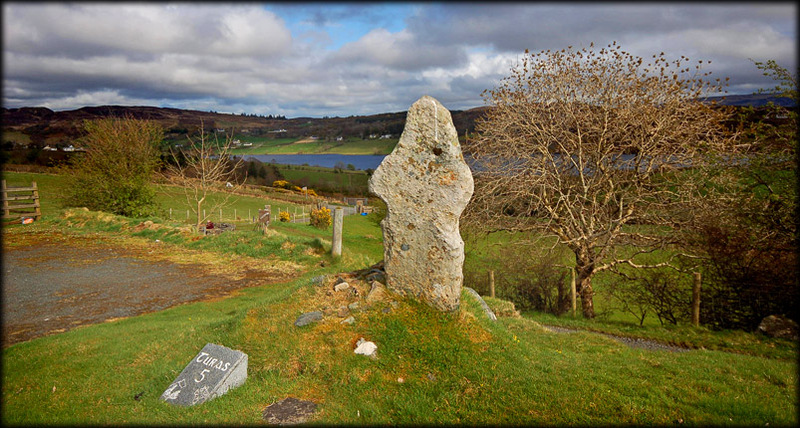 Gleanncholmcille is another site associated with Colmcille, but there are no historical records of him actually being there. 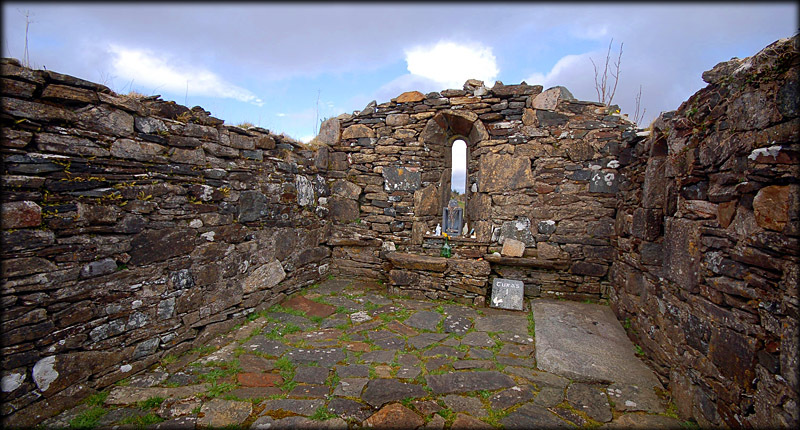 The monastic site at Gartan is built inside a hill fort that is believed to have been given to Columcille by his family. Nothing remains of the original monastery. On the grounds today are two boundary crosses, the foundation of a 10th century abbey, the ruins of a gorgeous 16th century church, a holy well, a graveyard. The well is a short walk down the hill from the main site and is surrounded by a low wall. 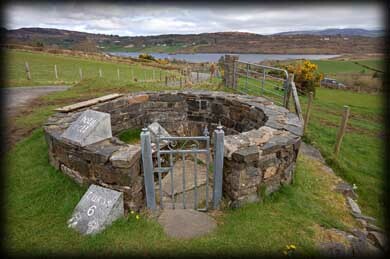 The well is part of the Turas that takes place here. In total there are 7 stations on the turas. The well is station 6 and the small stone seat inside the well house where visitors are said to bathe their feet while saying prayers is station 7. 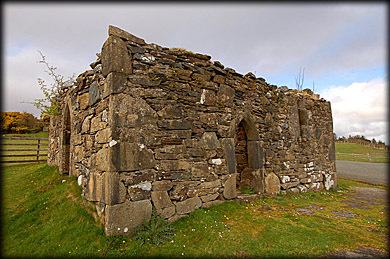 I just loved St Colmcille's Chapel, it was built in the 16th century by Manus O'Donnell, probably to commemorate his relative Colmcille. This is probably the chapel described in 1622 as being in repair and having a thatched roof. Apparently the chapel was in use up to 1810. On the leact/Altar stood what may have been the original birthing stone. This was Station 1 on the pilgrimage, the pilgrims would lift the stone and pass it around their body whilst praying. The large quoin stones, the doorway and the stone floor were a joy to see. 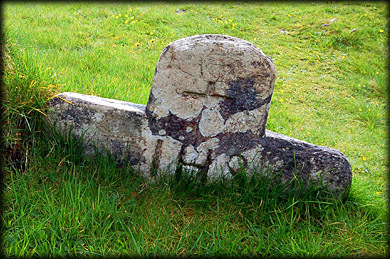 Very little remains of the abbey,only the foundation remains, but inside the foundation is the grave of the O'Donnell chieftains. The Cross shown in the top image, is a gorgeous early cross probably dating to around the 6/7th century. It stands on a small cairn and is Station 5 on the Turas. The upper cross is now inaccessible because the landowner has erected a fence and shrubbery has completely blocked the path to it. 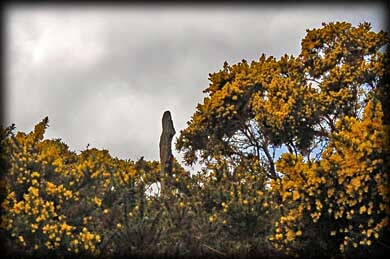 You can just see the cross sticking up from the gorse in the image opposite. This was possibly Turas Station 3. 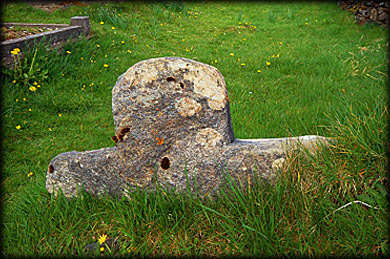 Scattered around the graveyard are some gorgeous early christian crosses and grave markers. If you visit this wonderful site then please take the time to wander around the graveyard. You will be well rewarded. Situated: From Letterkenny head south west on the R250 for 6 kilometres then turn right onto the R251. Drive for 7 kilometres, take the 3rd left after Church Hill. Drive 2.5 kilometres. The monastic site is on your left overlooking Lough Akibbon. Discovery Map 6: C 0582 1866. Last visit April 2010.